This lovely ranch-style home lies in the coveted Hiwan Hills community on a wonderful large lot with privacy and views. The home features beautiful hardwood floors throughout, abundant windows that let in lots of light, a central wood burning fireplace and a spacious bright kitchen with Swanstone counters, 6-burner gas stove, and breakfast bar open to the dining room. The bedrooms are all very spacious and have good sized closets. The master has its own Â¾ bath. Expansive usable yard and a wonderful huge deck with views and privacy. There is also a greenhouse with electricity and water and attached storage shed, in addition to the detached 2-car garage. 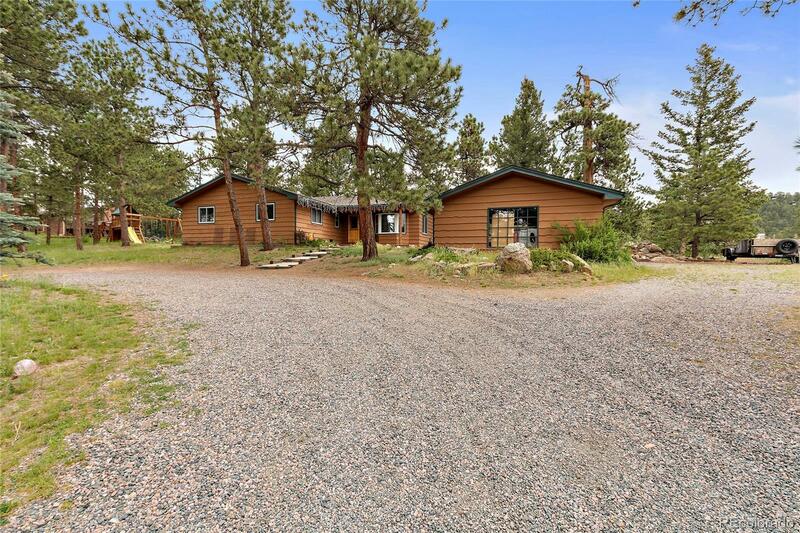 Quick access to I-70 and very close to all the Evergreen amenities. This is wonderful, main-level living in a charming and welcoming home in the very best of north Evergreen locations!